Here you can see the fresh rhizomes peeled for further use. Although quite pale in a few areas, the appearance is very much like that of a peeled carrot. Dried Turmeric has a very warm, slightly earthy smell with a faint sweetness. The taste, when used in cooked foods is somewhat pungent and peppery with ever so slight aromatically perfume-like quality. It can impart a bitterness to food if overused and this is somewhat ironic in that the spice is also touted for being able to reduce the bitterness of certain foodstuffs like Bitter Melon. The qualities of the fresh rhizome are quite a bit different than the dried or powdered variety. The smell is much less warm and has a sharpness a bit like raw parsnip with a definite pungency that is very like Marigold flowers. These qualities are also apparent in the taste but there is also a fresh grassy aspect to it that is quite pleasant. Turmeric is reported to have quite a number of medicinal applications, including being a very effective antioxidant. There is a lot conflicting and obviously merely anecdotal claims concerning the pharmacology (and I am not qualified to wade in on any of this) but I can say from personal experience that a little Turmeric can soothe an upset stomach. 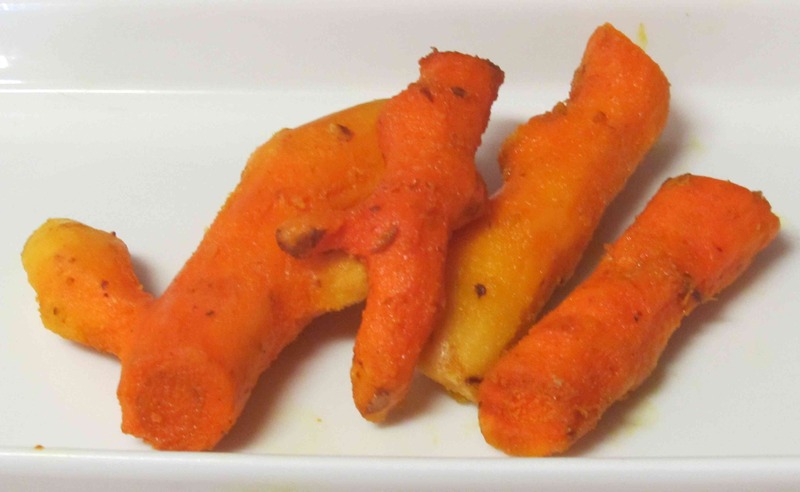 In culinary applications, Turmeric is widely as a component of curry powders and other spice blends, both in India and elsewhere. In The Indian Spice Kitchen, a very good book I highly recommend, the author makes the, somewhat extravagant, claim that Turmeric features in almost every Indian dish, but then does add the rather interesting proviso that it ought not to be used I dishes comprised largely of greens, warning that the spice robs the vegetables of their color. I have not noted this myself, actually, but this may well because I have only ever added Turmeric to such dishes in very small quantities. In the main, the fresh rhizome can be used in the same way as the dried and it is generally suggested that an inch or so of the fresh is a good substitute for a tablespoon of the powder. This is not a bad rule of thumb, perhaps, but usually more fresh Turmeric will be required to produce the same color and pungency as the powdered sort. 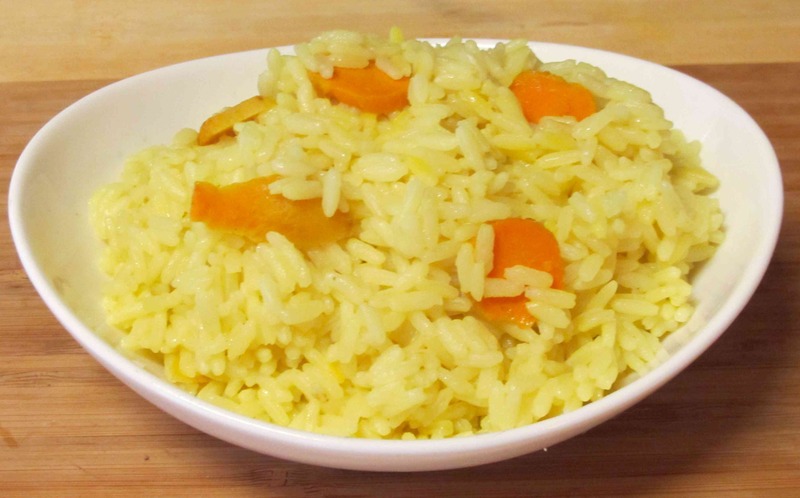 Turmeric is often suggested as a substitute for saffron if that spice is unavailable and, while the flavor is very different, the color it imparts to rice dishes in particular is almost as vibrantly attractive. 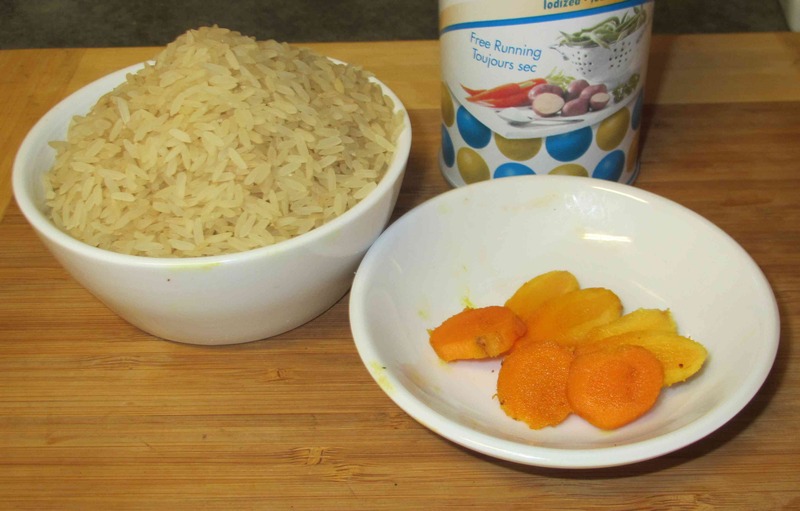 Cooking the spice with plain rice and very little else is a good way to test the difference between the raw and the dried varieties and, as an example, I have cooked approximately one inch of the fresh rhizome with a cup of rice and a little salt. If the dry equivalent of a tablespoon of powder were used with a cup of rice, the color would be considerably darker than the pale gold apparent above. The taste of the spice is definitely apparent in the cooked grains, but it is quite milder than one would expect from the pungency of the rhizome when raw. Ultimately then, though the fresh and the raw can be used interchangeably with pleasant effect, the result will be really quite different. I make a special breading for my fried chicken and add tumeric to it. Gives the chicken a nice color and adds that bit of sweetness to it. This was a good and useful article! That sounds like an interesting use. I’ll have to try it. 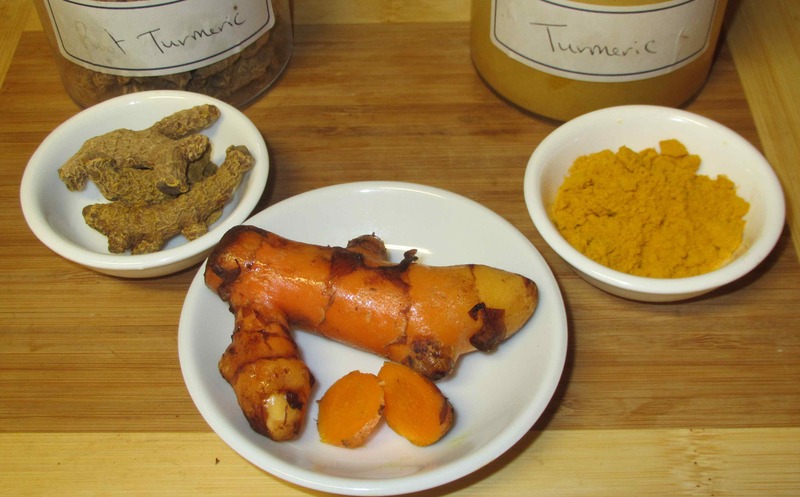 Nice post on turmeric…I have never seen it sold fresh here in New England. My pleasure… glad you enjoyed. Follow up post on making Turmeric paste in a day or so and a recipe for Pork Kebabs using the paste shortly thereafter. Thanks for all the info! I have often wondered exactly what turmeric is. I use a lot of Turmeric when cooking Asian dishes and have learnt to buy a big bag from either an Asian grocer or in the ethnic isle of one of our chain of supermarkets as it works out so much cheaper that getting it in one of those normally tiny spice jars! Never used it fresh though so must give that a try sometime. This is the very first time I’ve ever seen turmeric in non-powdered form. And that gets stale so quickly, I use it mainly for coloring. It’s also being used in clinical trials to improve memory and function in Alzheimer’s patients–it’s got some interesting properties. Thanks for sharing all this information about tumeric! I am going to see if I can find it in non-powdered form in Kitchener! If more people keep asking, the easier it will be to find. I can remember when fresh ginger was pretty exotic… now every supermarket carries it! This was very interesting! We potted some turmeric rhizomes out of curiosity, and they did magnificently. The only problem was, I didn’t really know what to do with them. Thanks to you, I will now be using our fresh turmeric in place of the dried. I was also interested to read of its effect on bitter melon, which although I enjoy can sometimes be too bitter for my taste. Turmeric is a staple in our kitchen. I had heard about its antioxidant and inflammatory from reading Scott Jurek’s book “Eat and Run.” I would love to find it in its non-dry form, but I’m not sure if I can find any here in Vermont. I’ll have t arch out some Asian markets and see what I can find. Thanks for a great post. It was super informative, and hopefully I can apply the knowledge when I find some. Thank you so much…. and stay ‘tuned’, more to follow! I didn’t know it came in root form. I like it except it turns everything yellow. Stains everything! I believe it has a lot of health benefits.